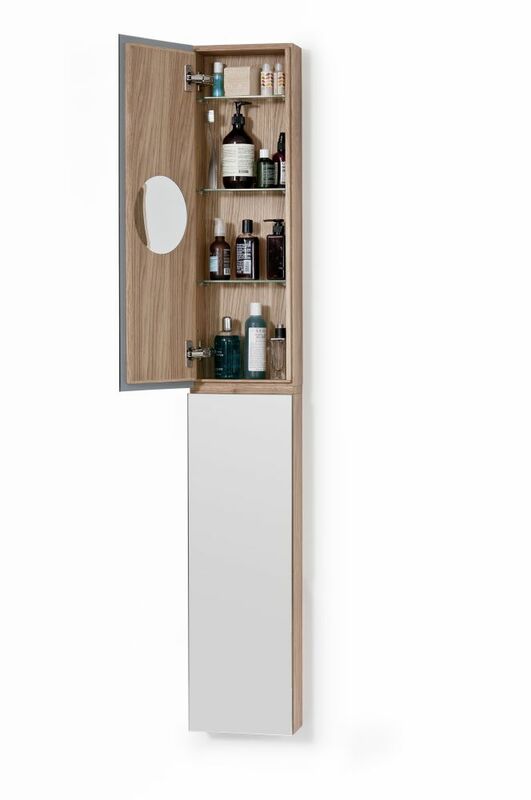 Zone 1622 double door cabinet design is perfect for those corners and walls where a full length mirror and capacious storage capacity is part of the brief. Mounted inside the doors there’s a special times five magnification mirror to give a much bigger close up view. Extending hinges mean the door opens wider so no awkward positioning needed to use the magnifying mirror. The cabinet can be fixed for either left or right hand opening. A full edge rebate extends on three sides to make door opening easy. Inside there are six moveable, polished, tempered glass storage shelves. The oak cabinet is assembled with filet corner joints giving strength and rigidity. Made from American white oak, finished with a matt, water resistant lacquer.